important that you advise us in writing of the name of the delegate(s) and the particular requirement by return but no later than Tuesday 18th October 2016. Crèche facilities will be available to delegates during the Conference and Branches should advise the SDGS Department in writing, by return, but no later than Tuesday 18th October 2016 if they require the use of this facility. Please ensure that the names and ages of the children, together with an appropriate address for sending the crèche form to for completion are included in this advice. It will not be possible to provide on the spot facilities to those delegates who have not informed us in advance. Motion forms must be returned by midnight on Tuesday 18th October 2016. All sections of the form must be completed. The Women’s Advisory Committee are entitled to submit up to three motions to the conference standing in their name. Each Regional Women’s Committee are entitled to submit one motion to the Women’s Equality Conference. Each Regional Equality Committee are entitled to submit one motion to the Women’s conference. Branches will be aware that with the carriage of Composite Rule Amendment 126 at General Conference 2013, the Women’s Conference has the entitlement under the rules of the union to submit two motions to stand in the name of the conference to General Conference and one motion to the Postal Group and Telecoms Industry Conferences. It is therefore important that if branches wish their motions to be considered for General Conference they must contain policy that is capable of being discharged by the NEC, as opposed to either of the Industrial Executives. Theresa May campaign at the recent 2016 Hazards Conference and all Trade Unions have been asked to promote the campaign by asking people to send a postcard to the Prime Minister. The CWU Health, Safety & Environment department has agreed to set the Union a target of getting 1000 Postcards sent to No 10 Downing Street and these are being distributed with 100 Postcards each to the 10 Regional Health and Safety Forums, requesting that all Safety Reps throughout the Country obtain a number of the Postcards from the Regional H&S Forum Secretary, send off a Postcard and get other Reps, Officers and Members in their Branches to complete and post off the Cards also. Hazards tell us that so far they have sent out 4,000 Postcards – CWU has now made that 5,000 but we need Reps to respond and action the request, supporting the campaign. to tackle inequalities across society. morbidity gulf between rich and poor. The NEC has agreed the 2016 election arrangements for the National positions listed above. Accordingly please find enclosed the Regulations and Nomination forms. The Regulations have been produced to ensure compliance with the relevant rule changes agreed at the 2016 CWU Rules Revision Conference which in respect of the CWU Youth Committee are that the size of the Youth Committee has been increased from 10 to 20. This is on the basis of one member coming from the TFS Constituency and one member coming from the Postal Constituency for each of the 10 CWU regions. Additionally all candidates must be aged 29 or under at the time of the election. The term of office for the 2016 – 2018 CWU Youth Committee will be from 30th September 2016 to 30th June 2018. Each candidate needs the nomination of their own branch. The election is by means of a branch ballot within each respective constituency i.e. branches with members in the Postal Constituency will vote for the 10 Postal members of the committee and branches with members in the TFS Constituency will vote for the ten 10 TFS members. This is to remind Regional Health and Safety Forums and Health and Safety Reps across the Union about the updated, excellent Training Programme for August 2016 – July 2017, provided in-house by the CWU Education and Training Dept who have taken on board Conference Policies in consultation with the Health, Safety & Environment Department. Following on from the Conference decision in Motions 89(2013) and 33(2015) a Health and Safety Refresher Training Course for experienced and trained Health and Safety Reps was successfully introduced and delivered in 2015/16 and that course is being repeated again in the current 2016/17 programme. In respect of Mental Health and part of Motion 37(2015) was to raise awareness, an important factor is raising awareness amongst Health and Safety Reps and Union Reps in general. A Mental Health Awareness Course has been added to the 2016/17 programme and will hopefully become a permanent addition. The course has previously been run in past programmes, but has never been more important. There has been a restructuring of the previous Health and Safety Reps Stage 1, 2 and 3 Courses and the Occupational Health Course. These have been combined and re-badged as the Introduction to Health and Safety Part 1 and Part 2 and Intermediate Health and Safety Part 1 and Part 2. The aim is for the Health and Safety basic and intermediate programme to be completed in one academic year of the programme. In relation to the TUC Diploma in Occupational Health and Safety Course which is the advanced training course which follows Basic and Intermediate Training, the Education and Training Dept intend to run one of the courses before the end of the 2016/17 programme year. PTUC will be working with the Anne Frank Trust for the last two weeks of September displaying ‘Take A Stand’ exhibition boards in St John The Baptist Church (Cathedral Square). The boards display information about Anne Frank, Ghandi, Martin Luther King, Rosa Parks. The Anne Frank Trust are keen we build community events around this such as meetings, etc. There is a meeting at City College Peterborough at 12 noon on Wednesday August 31 to discuss what events we can build around this with regards to promoting toleration and unity following the Brexit vote and low level racism that has occurred in the city since. Please forward to any community groups you think might be interested in taking part – all welcome at the meeting. We will also be looking for stewards to explain the boards to visitors. Please let me know if you are available to help with this, or know anybody else in your Union branch or wider community who might be interested in helping with this. Full training will be given by the Anne Frank Trust. A poster is attached. 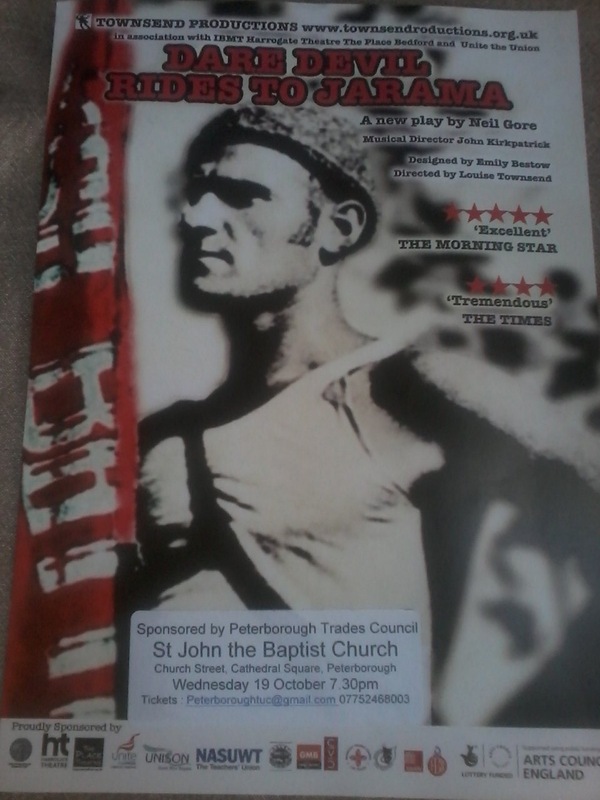 The performance will start at 7.30pm on Wednesday 19 October at St John the Baptist Church, Chruch Street (Cathedral Square), Peterborough. Tickets cost £10 / £8 (Conc.) and can be obtained by email via peterboroughtuc@gmail.com. Please make sure you get your ticket ASAP and encourage your friends, family and people in your networks to attend too. Earlier this year the CWU registered with the Electoral Commission as a Campaigner ‘to Remain’ in the EU Referendum. This was a legal requirement for any organisation campaigning to remain or leave the EU who intended to spend in excess of £10,000 on their campaigns. Following CWU Conference, we issued LTB324/16 which explained the activities planned by the CWU and to make branches aware of the legal requirements with which the union had to comply. We stated that any spending by the CWU in campaigning on the EU Referendum would need to be reported by the union centrally to the Electoral Commission. We asked branches to contact us in advance of any campaign activities that they wished to undertake, to ensure compliance with the legal restrictions. The Union is now required to report to the Electoral Commission, so we would therefore be grateful if branches could forward to the General Secretary’s office details of any branch monies spent on the CWU EU Referendum Campaign. This should include a breakdown of each amount and the exact item (i.e. leaflets, badges, postage etc). This information should be submitted to gsoffice@cwu.org by 7th September 2016. All those attending the conferences will be invited to a social event and further details will be circulated to delegates nearer the time. If anyone requires a crèche, could you please email conferences@cwu.org as quickly as possible with details and for what conference in order that arrangements can be made. Please email conferences@cwu.org as soon as possible if a delegate requires a prayer room so that arrangements can be made for a quiet room to be made available. Please state the conference that the facility will be required. If anyone needs a signer please email conferences@cwu.org as soon as possible stating the conference the delegate will be attending. Further information will be issued regarding online registration in due course. In order that we can cater for any delegate(s) with special needs such as seating, it is important that you advise us in writing of the name of the delegate(s) and the particular requirement by return but no later than Tuesday 22nd September 2016. Crèche facilities will be available to delegates during the Conference and Branches should advise the SDGS Department in writing, by return, but no later than Tuesday 22nd September 2016 if they require the use of this facility. Please ensure that the names and ages of the children, together with an appropriate address for sending the crèche form to for completion are included in this advice. It will not be possible to provide on the spot facilities to those delegates who have not informed us in advance. The Disability Advisory Committee are entitled to submit up to three motions to the conference standing in their name. Each Regional Equality Committee are entitled to submit one motion to the Disability Conference. Motion forms must be returned by midnight on Tuesday 22nd September 2016. All sections of the form must be completed. Branches will be aware that with the carriage of Composite Rule Amendment 126 at General Conference 2013, the Disability Conference has the entitlement under the rules of the union to submit two motions to stand in the name of the conference to General Conference and one motion to the Postal Group and Telecoms Industry Conferences. It is therefore important that if branches wish their motions to be considered for General Conference they must contain policy that is capable of being discharged by the NEC, as opposed to either of the Industrial Executives.